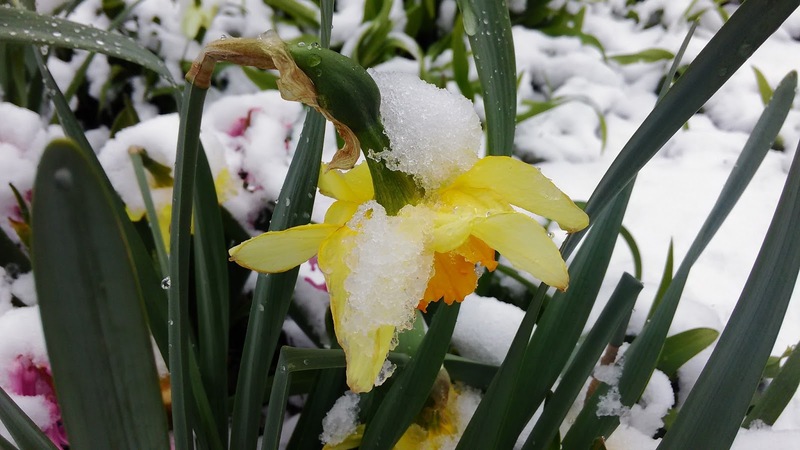 Deciding to postpone a randonneuring event is one of every organizer's toughest decisions. Thankfully, the decision to exchange a day of snow, freezing rain, bitter cold, and wind for clear skies and moderate temperatures proved to be the right decision this year even though several teams were forced to shuffle members and one team had to forego the fleche entirely. Eight teams who started on their adventures safely reached the Weisel Hostel. Seven of those arriving within the allotted 24 hours. Congratulations to all of the captains and teams. Well done! 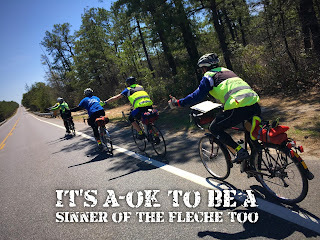 Given the perfect weather resulting from the prescient rescheduling, I'm sorry to report that our fleche, while incredibly enjoyable, didn't provide any memories that would fall into the "epic" category. Of course it's pretty simple to have an enjoyable, calm, stress-free fleche when you're riding, as I was, with 2 amazing rando-dudes Chip Adams and Gavin Biebuyck. After alerting the waitress at Muellers Too about the rash of randonneurs they would be seeing Sunday morning, we crossed the Delaware river at Milford (after denying Gavin a stop for croissant). We decided to forgo the morning traffic on NJ 29 and navigated the Delaware and Raritan canal trail to New Hope. For those that have not experienced the D&R, it's primarily hard packed dirt, enjoyable to ride and really pretty. As we crossed the bridge back into PA, we were astounded by the number of fishing boats on the Delaware and realized that the Lambertville Shad Fest is coming up in a couple weeks. After controlling in New Hope we passed the mansions of Southern Bucks County en route to one of the best Fleche Controls of my life at the Craft Ale House in Limerick (this, unsurprisingly was a recommendation form Gavin}. After sampling some stout, ale and lager we quite happily set back out into remarkably bright sunshine en route to our Schuylkill River crossing and eventual arrival at our 3rd river, the mighty Susquehanna. After ascending river road and passing the Turkey Hill ice cream factory, we took Chip on a tour of (what seemed like) every freaking Turkey Hill convenience store in Lancaster and Berks counties. We quite happily arrived at the wonderful Americana Diner in Boyertown with a 2 hour time "cushion" and utilized the "cushions" in their comfy booths where we slept fitfully until poor Gavin awoke with a cramp. Shivering in the cold, we remounted and, after waiting until the appointed time at our 22 Hr control in Green Lane, climbed up to Red Hill and followed new (and relatively smooth) roads through Trumbauersville to the finish. It was wonderful to see everyone smiling and safe at the hostel. Thanks Tom and Andrew for another incredibly well organized Fleche. The schedule change must have been a real headache but thanks for all the extra work to keep us safe. Jane Brown apparently spent all night cooking some of the best Chili I've ever tasted (oh and Joe was there too). After two previous fleches with the Sinister Nuts, Captain Bob Torres decided to try his hand at the helm. He kept most of his team together during the rescheduling only to succumb to a last-minute personal emergency that prevented him from starting. Acting Captain Gil Lebron stepped up and led the team to a flawless finish, enjoying nearly every minute of the allowed 24 hours. For those of you who can't recall seeing the Les Flecheurs team at the hostel on Sunday, you're not crazy. Gary Mass and his team started on Friday and finished on Saturday as most of the other teams were just getting started. The team ran a tightly controlled route, one of two that required a 2-sheet card. Another postcard! What should we say this time? The overnight segment to Shartlesville was actually very pleasant and quiet. Although the very slight climbing upwards did take its toll on us, we experienced random warm fronts that took the chill off. The truck stop was a great recommendation (thanks for that, Andrew! ), and we all got some much needed food and rest time. Running parallel to 78 during the night, it was funny to see signs that said "64 Miles to Allentown" and joking with the team, "Hey guys, want to ride 64 miles to Allentown? Oh wait....."
We were quick through Allentown in order to hustle to Riegelsville, and made it into Mueller's with about a half-hour to spare (6:30AM). Was glad Tom was there to greet us! Some food and chatting with The Sinners and Sinister Nuts, and we were ready for the home stretch back to the hostel. Even though climbing to finish was bad, the rough roads approaching the hostel were worse! But we were naturally all smiles turning into the hostel driveway. A successful flèche in the books. Thanks so much for hosting and organizing a great event! Postponing the flèche for a week was a great decision as we enjoyed blue skies during the day and cold, but dry conditions after dark. 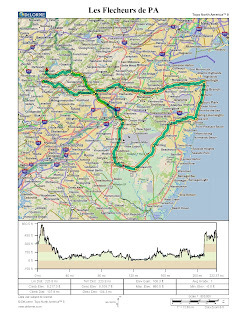 My GPS computer recorded a high of 80 degrees and a low of 32 degrees during the NYGTF team ride: quite a temperature swing! And thanks to the frigid nighttime temperatures, staying awake during the wee hours of the morning was no problem at all. As the weak link, I was nervous about letting the team down on my first flèche, but thanks to the support and encouragement of our experienced team members, I had a memorable and enjoyable time. I ride solo on many brevets and perms as I often have trouble keeping up with the faster kids. It was great to ride a team event where riders were not as inclined to drop me like a wet sack of sand. 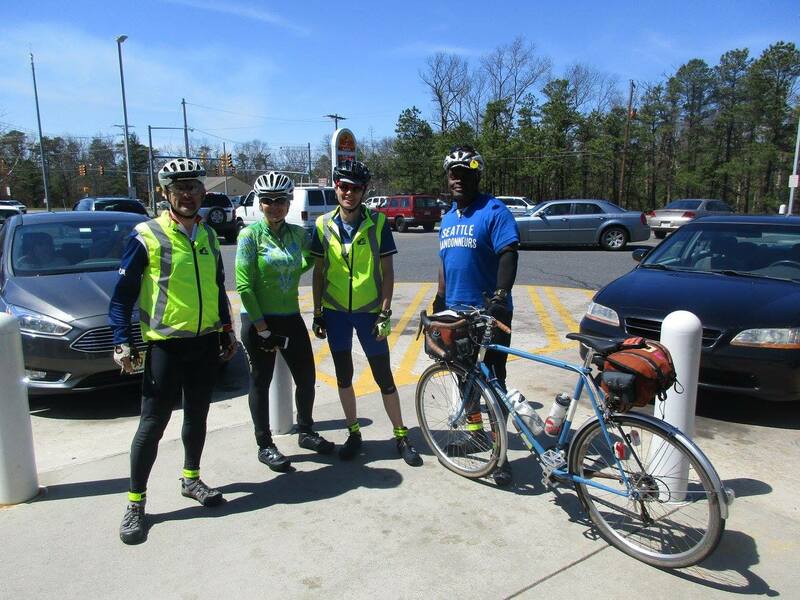 Captain Eric Keller designed an awesome route that meandered 229 miles through the mountains and valleys of central and eastern PA, connecting his driveway in Boalsburg, PA to the Weisel Hostel at the finish. He was kind enough to incorporate plenty of challenging climbs to keep us warm as temperature plummeted after sunset. And, we found many mysterious “EM” symbols stenciled onto the shoulder of the road along the way-I am still trying to figure out what these mysterious markings mean. Looking fresh and chipper in Lewisburg. The Quesadilla Quest team was led by first time Captain Zach Goodrich and gets my vote for over achievers. The route may have been "only" 360k (necessitating 17 controls), but it featured significant climbing, many miles of unpaved surface, and even a little bit of single-track. Imagine all that and throw a tandem into the mix and you can understand how this team couldn't quite manage to reach the hostel in the allotted time. Zach reports: Team Quesadilla Quest, etc. began their journey at Rolando’s Diner in Binghamton, NY at 9am on Saturday. Despite our bellies full of eggs, homefries, and watered down coffee - thoughts of burritos, enchiladas, and chimichangas drove us forward in pursuit of the finish. Chris N. and James H., were each on single bikes, while Erin R. and I rode tandem. We left the beautiful Parlor City cruising at a good clip down NY-7 towards Hallstead, PA. We reached our first controle in New Milford just around our scheduled time. After an efficient stop, we left a small valley and headed upwards over a few hills, skirting Tingley Lake on pleasant roads, several of them unpaved. In a short time, we arrived in Kingsley where we joined Martin’s Creek, which we would follow to its confluence with Tunkhannock Creek in Nicholson. We rode on several dirt roads, following the creek on the opposite side from US-11. The short undulating hills and bumpy surface surly slowed us down, but it was nice not to worry about heavy traffic coupled with poor road conditions on US-11. 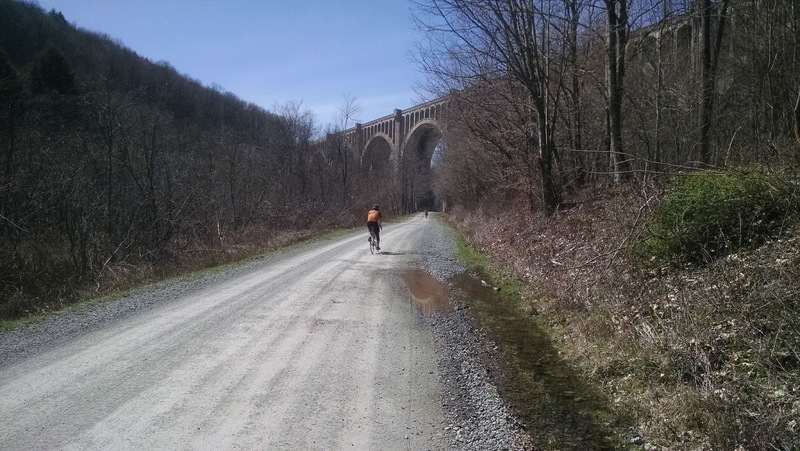 We rode without the stress of traffic on Creek Rd, Sheepy Hollow Rd, and other variations until reaching Nicholson and the Tunkhannock Viaduct, which is part of a section of the Lackawanna Railroad between Binghamton and Scranton. After getting some photos, we departed once again and rolled up and over several hills, criss-crossing US-11 through La Plume, Factoryville, and Dalton. A rear flat on the tandem cost us much of our banked time from the start, but we shrugged it off and made our way towards Scranton. The road leading into Scranton was one of the few roads in the northern section of our route that I had not ridden before, and its approach included a steep climb up to the “lip” of the Lackawanna Valley before descending. The descent was sharp and quick, and although it was fun, it left us feeling like we did more climbing than descending. After winding through the City of Scranton, and checking off 2 controles to keep our minimum distance, we started a challenging climb out of the valley and into the Poconos. These roads were familiar and pleasant, but even so the ascent was long. Several quiet residential roads gained elevation rapidly moving southward, but abruptly gave way to Elmhurst Blvd which looks to be an old gravity railbed, although I’m not sure. We wound our way up out of Dunmore via a shallow, consistent grade, following the Roaring Brook mid-slope until we reached Blue Shutters Rd. Although we were starting to get tired, the team was in good spirits and motivated by the fact that our next controle, the North Pocono Public Library, would be closing in less than an hour. We left Blue Shutters for an unmarked, unmaintained, jeep trail which made up much of our remaining elevation to the library. This road was one I was hesitant to include as it was essentially a mountain bike climb, but thankfully we made it through without issue. We all picked our lines as if riding single track. Chris, Erin, and I probably had the easiest time navigating rocks, tire ruts, and small downed trees with our wide tires, but James tackled the ascent like a cyclocross pro. We made it up the mountain and into the Library with 20 minutes to spare. The controle was a good stop for filling up water, but the tray of baked goods on display in the library’s meeting room left Chris feeling like the cookie monster (although he did not act on his desires). 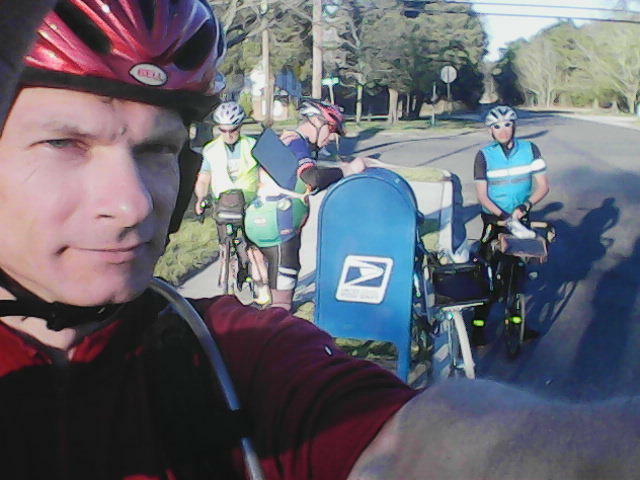 We left the library heading westward, feeling pretty cool with official library stamps on our brevet cards. 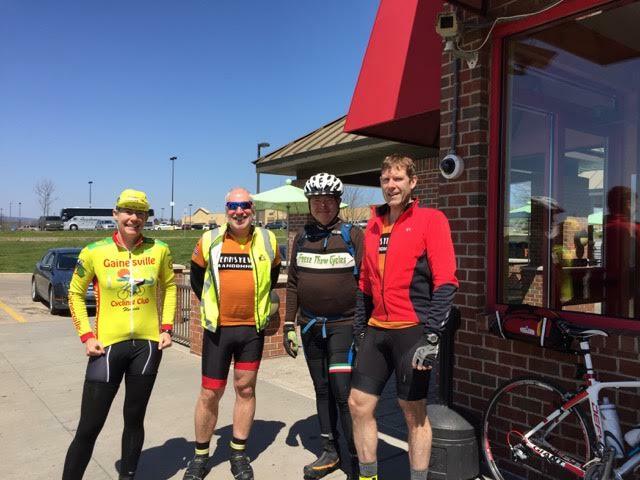 23 miles of riding through the upper Lehigh watershed found us in Bear Creek, where we refueled on pizza and our spirits were renewed. After a 1.5 mile jaunt on PA-115, we descended a short gravel road to Whitehaven Road, where we cruised along to the Frances Walter Dam, a large flood control structure at the north end of the Lehigh Gorge. The dam road spit us out onto PA-940, where we stopped for a quick bite at the Whitehaven Wawa, and got our lights and vests set up. We made the final descent to the Lehigh Gorge and hopped on the D&L trail for 23 miles to Jim Thorpe. The D&L was the only lengthy section of flat road we had encountered yet on the route, and though it was crushed stone, we were able to get into a rhythm and put some time in the bank. The trail made for a pleasant, traffic-free night ride. It was nice to forget about the cues for a while and tell stories. The gorge was abundant with wildlife, much of it unseen but evident. We passed by several napping porcupines, luckily none of which were directly in the trail! 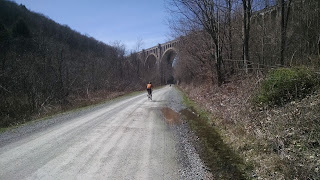 We braved the short and unpleasant stretch of US-209 from Jim Thorpe into Lehighton and got back on the D&L trail. A bridge proposed in Jim Thorpe will eventually connect the section of trail between Lehighton and Jim Thorpe, eliminating the need to ride 209. We exited the trail after passing under I-476 in Bowmanstown, and took refuge in the Bowmanstown Diner where we filled up on hearty diner food and copious amounts of coffee. After a reasonable Diner break, we took again to the night, just slightly now behind the minimum pace, but determined to make it up. 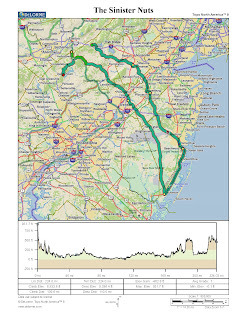 The following stretches of road took us through Palmerton, and then following the north face of the Kittatinny Ridge and the Aquashicola Creek. Stars were visible, and the moonlight illuminated the long mountain to the right of us. We were able to move at a brisk pace through the Aquashicola Valley, up until the last two miles where we made our climb up into the Wind Gap. Arriving at the Turkey Hill, we were again just off of the minimum required pace, but this controle was the turning point in my mind. The miles that followed were many roads I had not ridden before, and in worrying about getting our team to the finish in time, I neglected to keep up with proper nutrition. We left Wind Gap for Belvidere, taking the most direct route up and over two stream valleys, then finally descending to the Delaware at the hairpin turn on Riverton Rd, a familiar location for PA Randonneurs. The roads quiet and pretty at night, but very slow going. Chris and James moved on at a consistent pace, but the tandem began to slow. The real mistakes in the route design began to manifest themselves just east of Belvidere, where we grinded up and over a sizable hill to Oxford. At this point, I had fully entered the limits of bonktown. It wasn’t far until our next controle in Bloomsbury, but we moved slowly over the next few hills, as I struggled to stay awake and coherent. Despite the lack of sleep, almost 21 hours of riding, and the fact that Erin had ridden 50% further than she had ever before, she was the vibrant cheerleader keeping us together and keeping me awake. Just before 7am, we reached our Bloomsbury controle with 53k remaining. Because we had two controles yet to visit, and a long climb up Lodi Hill Rd remaining, we came to the ugly realization that we would not finish the ride in 24hrs. Although we were all certainly disappointed in timing-out, we were glad to take our time relaxing and refueling at our next stop, the Milford bakery, our planned 22hr controle. We made the short steep climb up Lodi Hill from the delaware, and finished out the last miles to the hostel during a beautiful morning. As a relatively new randonneur, and the route designer for our team, I was probably overly ambitious regarding number of controles, road quality, and climbing (especially climbing for a tandem). I had designed the route using many of my favorite low-traffic roads and trails in NEPA and strung them all together. We estimated about 50 miles of the route to be dirt or gravel, and delorme put us up above 18,000 ft of climbing. Although the route was fun, scenic, and low traffic as was intended, it was just too much for our team to fit into 24 hours. I did received some useful input from veteran Chris N. who joined our team late in the game, it was too late to make significant changes to the route. I have to say that all of my teammates truly exemplified the randonneur mentality on this ride. They accepted the challenge with a smile and there were no complaints throughout the duration. We fought with very minimal time out of the saddle until it was clear were were not making it in under the allocated time. Thanks to Chris, Erin, and James for making it a great ride despite the difficulties. I was very lucky to have both fun and stoic teammates. Congratulations to James and Erin, for which this was their first ride over 200k. Of course, many thanks to Tom, Andrew, and all of the volunteers for all of their work, and for waiting to greet us at the finish. I’m looking forward to attempting the fleche again next year. As so aptly observed by 3-time PA flecheur Chris Nadovich, "It was really an enjoyable route. Our Capt'n Zachary created a gem. But some of the dirt roads were actually the faster miles. There were many big climbs packed end to end, and lots of controles. In the end, we just couldn't fit all that fun in a mere 24 hours." In what had originally begun as a two-team effort, first time captain Kate Marshall guided the Sins of the Fleche Too team on a sweeping tour of the Jersey pine barrens with little fuss or drama. A word of caution to the SOTF One team for the future: you'll need to ride quickly if you put Kate and Victor behind you. We heard reports of daytime rolling averages in the 17 mph range. You guessed it, a WaWa control. Photo from Chris Newman. Chris Newman compiled her pictures here. Nine-time fleche finisher Bill Olsen and his band of fixed-gear nuts returned for another overnight adventure, each year seemingly convincing some unsuspecting randonneur to try the fleche on a fixie. This year's victim was Robin Landis. While he pedaled to the finish, walking was a different matter and required a rather unique method for dismounting the bike. Congratulations to all participants for making this year's fleche another success. Finally, a hearty thank you is due to Jane Brown for preparing the arrival banquet enjoyed at the hostel and to her able assistants Joe Brown and Jim Holman. Most everyone arrived with a big appetite; no one left hungry. The Browns have been supporting the fleche for a few years and raising the bar each year. It is volunteers like this who make our events so memorable, successful, and possible. Want to help? Check the volunteer sign-up page or contact Tom or me.